Reported waits of up to eight hours in line to buy the iPhone 4 Thursday indicated that first-day sales were going to be good. And while Apple has not yet announced official sales numbers, some Wall Street analysts have done some extrapolation based on interviews with customers at stores around the U.S. Thursday. On Friday, Oppenheimer's Yair Reiner did a little math to estimate that Apple may have sold more than 1.5 million iPhone 4s to date. He gets there by adding the 600,000 preordered units Apple announced last week, plus estimating 100,000 units sold to walk-in customers (guessing an average of 500 per store), 50,000 units sold to Best Buy (about 45 per store), and then doubling that number to include international sales. There's no way to know how accurate those numbers actually are--Apple doesn't publicly disclose how many units are distributed to each store--but it seems plausible. Apple may release sales numbers sometime Friday, or it could wait until after the weekend, as it has with past product launches, to enumerate their total four day sales numbers. Apple sold 1 million iPhone 3G units in the first weekend it was for sale in 2008, and 1 million iPhone 3GS units during its first weekend available in 2009. Separately, Piper Jaffray analyst Gene Munster polled people queued up for the iPhone 4 Thursday and based on their responses, estimates that 77 percent of people buying a phone yesterday were previously iPhone owners and were upgrading. 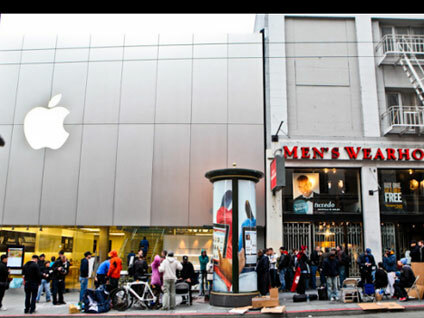 "We spoke with 608 people in line for the iPhone 4 (Thursday) in San Francisco, Minneapolis, and New York.," Munster wrote in a research note Friday. "The bottom line: 77 percent of new iPhone buyers were existing iPhone owners (upgrades), compared to 56 percent in 2009, and 38 percent in 2008. Apple is effectively building a recurring revenue stream from a growing base of iPhone users that upgrade to the newest version every year or two." Erica Ogg is a CNET News reporter who covers Apple, HP, Dell, and other PC makers, as well as the consumer electronics industry. She's also one of the hosts of CNET News' Daily Podcast. In her non-work life, she's a history geek, a loyal Dodgers fan, and a mac-and-cheese connoisseur. E-mail Erica.